CTET Answer Key 2019 – As soon as the Central Teacher Eligibility Test (CTET) exam gets over on July 7, 2019, candidates start looking for answer key. Those who appear in Paper I for classes I to V look for CTET Answer Key Paper 1. Whereas teaching aspirants of Paper II for classes VI to VIII look for CTET Answer Key Paper 2. For each paper, there are 4 sets of question papers and corresponding answer keys. Get here all PDF download links of CTET Answer Key 2019 and details about official answer key by CBSE at ctet.nic.in, result, cut off. 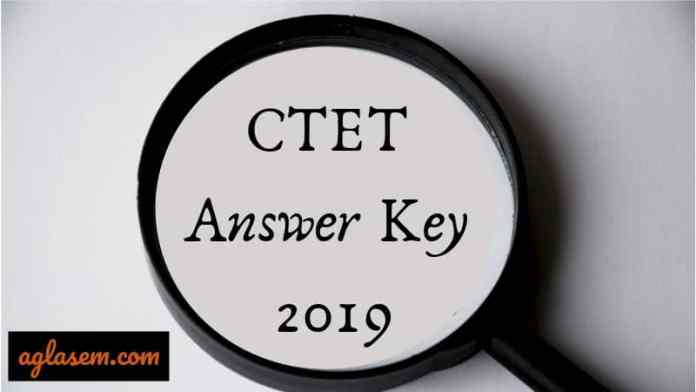 You can download CTET 2019 answer key and watch its videos here. Whereas solved question papers available right after exam are by unofficial as they are by teachers and institutes, answer key issued by Central Board of Secondary Education (CBSE) is official. Check dates of all related events in table below. You can directly download PDF files of answer keys. Just go to the links below to view / download solved question papers of CTET July 7, 2019 exam. Please note that Paper 2 is from 9:30 AM to 12 Noon, and Paper 1 is from 2 PM to 4:30 PM. The answer keys can be viewed only after exam gets over at these times. Help us publish the CTET answer key 2019 quickly! You are a future teacher of India. The nation needs noble minds like you to teach and lead it. You worked very hard and we are sure you will get through. At AglaSem, our wholehearted efforts are driven towards helping aspirants achieve their dream. We provide all study material for free. We try to publish authentic CTET Answer Key 2019 for you just after exam. However to do that, we need your help. Please email your CTET 2019 Question Paper to [email protected] after the exam gets over. By receiving your question paper, we will be able to quickly make answer keys and provide them for you in PDF and video format. Thank you for your support. Best of luck for your result! How to Calculate Marks through CTET Answer Key 2019? After fetching the CTET Answer Key, the candidates can get the idea of marks in the exam, which he/she will get. Before proceeding to calculate marks, ensure that you are matching keys against the question paper set/code received by you during the exam. At, first calculate the total number of correct answers. Central Board of Secondary Education releases official answer key of CTET a few days / weeks after exam. Date of publication of CTET Answer Key, OMR Sheet, Challenges are put up as a notice on ctet.nic.in first. Then answer key is released in PDF format. Candidates can download answer key PDF and login to view response sheet, challenge answers, responses. Please note: In the case of unofficial answer keys, candidates can directly download PDF files. However in case of official answer key from ctet.nic.in, one has to log in with roll number and date of birth. Thus, keep your login credentials handy. When will CBSE release CTET Answer Key 2019? CBSE will release CTET Answer Key in July / August 2019. As soon as official date is out, we will update it here. Until then, take a look at past year timelines to get an idea of date of issuance of CTET answer key by CBSE. Answer key contains answers of all questions asked in CTET 2019 Paper 1. Answer key contains answers of all questions asked in CTET 2019 Paper 2. How to download CTET Answer Key from ctet.nic.in? Candidates can download official answer key from ctet.nic.in. In the immediate hours/days of release of official answer key, the official website is the only place to get answer key from. However later on the PDF files are directly downloadable. Please note that this process also takes viewing OMR sheet into account. Step 1 – Go to ctet.nic.in. You can see link of view answer key, OMR sheet on the main page. Click it. Step 2 – Login with roll number and date of birth. In case you have forgotten roll number, check it from admit card of CTET 2019. Step 3 – Download CTET answer key, OMR sheet. When you login, you see your paper details, languages chosen and their codes. Then there are links to download answer key, and OMR sheet. If you appeared in any one paper then there will be one link. If you appeared in both papers then there will be 2 links. Both files download as PDF. How To Raise Objection on CTET Answer Key 2019? After getting the answer key, if any candidates are not satisfied with the answer key, then he/she can raise objection towards the answer key. For doing so the candidates will have to pay the objection fee. The fee has to be paid for a question. The candidates should raise the objection if he/she is certain about with his/her explanation for the answer. Then only the objection should be raised along with the proper reference. Without any reference, the objection will not be considered. The candidates have to use the same link for raising the objection which is provided above. The candidates have to pay an amount equal to objection fee. Last time it was Rs. 1000/- for each question. The objection fee is non-refundable if it gets rejected. The CBSE will refund the fee if the Objection raise by candidates gets accepted. 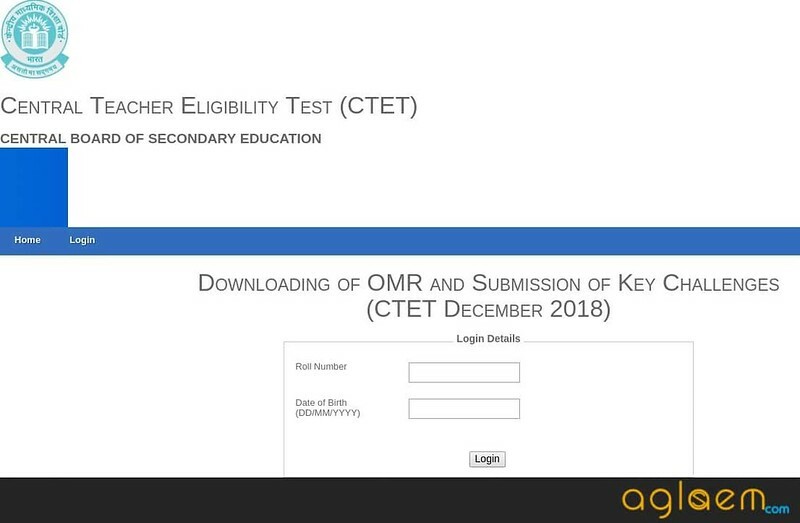 How to Get Photocopy of OMR Sheet with CTET Answer Key 2019? According to the latest notification by CBSE, the OMR sheet and the Answer Key of CTET examination will be displayed on CTET website ctet.nic.in. The candidates will be able to see the answer sheet in the login. If any of the candidates want to get the OMR sheet then they may also do so. To get a photocopy of the CTET OMR Sheet with calculation sheet, the candidates will have to pay Rs. 500 to CBSE. The money is to be paid via Demand Draft, which is to be prepared in favour of Secretary, Central Board of Secondary Education, payable at Delhi. Candidates can make the DD from any Nationalized Bank. Once the CTET examination overs and answer key released by CSBE, the result is declared within the 06 weeks of examination. CTET 2019 notification also certify the same. However, in the last examination of CTET, the CBSE announced the result within one month. The candidates who will appear in the exam will be able to check the same with the help of roll number. CTET qualified and will be issued the Eligibility Certificate of that level in which he/she will appear. After a few days of result declaration, the marks statement will be shown through login. The candidates who will obtain the more than or equal to minimum qualifying marks will be declared as qualified. Official website of CTET is ctet.nic.in. If you have any questions on answer key of CTET 2019, please ask in comments below.